Annabelle was found as a tiny, emaciated stray pup with a huge growth on her backside in Paterson. Animal control promptly contacted staff at the Ramapo-Bergen Animal Refuge, Inc. for help. Volunteer manager, Francesca “Frannie” D’Annunzio immediately dropped everything to pick Annabelle, rushing her to Oradell Animal Hospital. Despite Annabelle’s difficult, painful life and obvious discomfort, she was as sweet as can be – a quiet little girl who had endured so much in her short life. 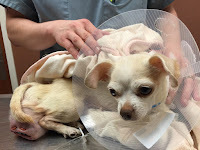 Annabelle is a younger female Chihuahua with vaginal hyperplasia. She survived days out in the cold weather, sick with no food or water until she found her way to RBARI. In the few short hours that D’Annunzio held Annabelle while waiting for the doctors to diagnose her, she gave her as much love as she could, fearing that she may not make it out of the hospital. Annabelle gazed up at her, confused but adoring the kind touch and attention. Doctors said the prognosis for Annabelle is very guarded. They believe the vaginal hyperplasia is from excess hormones. Surgeons will spay Annabelle and stabilize the area in an effort to reduce the tissue with time and rest. Annabelle may face further surgery to remove dead tissue and will need supportive care and close medical supervision to fully recover. Annabelle is not a dog with a lifetime of love behind her. She is a dog that still needs to learn what it’s like to have a warm, safe home and all the love in the world. Annabelle has received multiple blood transfusions, intravenous fluids and now major surgery in an attempt to save a beautiful life. If you would care to donate to help save Annabelle go to https://rbari.org/annabelle/annabelle.html. Checks can be sent to RBARI, 2 Shelter Lane, Oakland, NJ 07436.